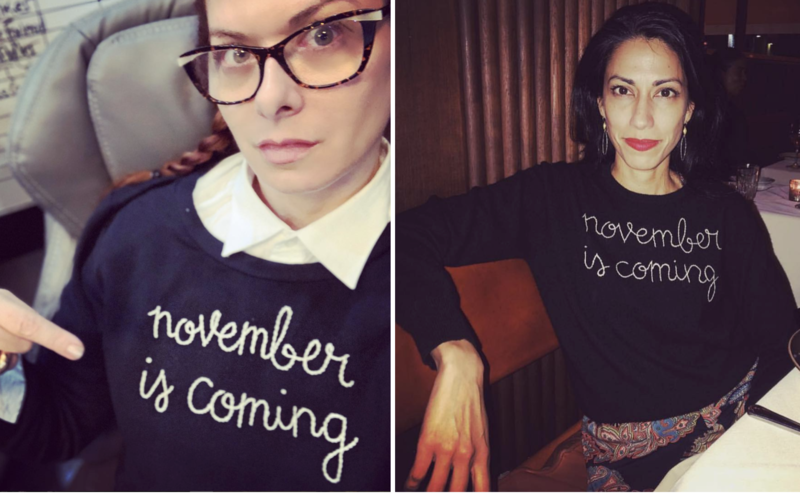 Debra Messing and Huma Abedin are ready for November 6th. Are you? 1. Commit to text people during this GOTV (Get Out The Vote) weekend. It's simple, just make a pledge and then put your fingers to work! Go HERE to sign up and start texting! 2.Volunteer to phone bank now (from anywhere). Heads up: this is a Democratically led initiative. And, well, I don't know where you've been if you think we are in any way nonpartisan ha! 3. Study up! Find out what your ballot is going to look like on Nov 6th so you are prepared to walk into that voting booth like a rockstar! Senator Kirsten Gillibrand has a new children's book coming out and, spoiler alert, it's AMAZING. The book, titled Bold & Brave: Ten Heroes Who Won Women the Right to Vote, introduces children to strong women who have raised their voices on behalf of justice. Gorgeously illustrated by the renowned artist Maira Kalman, it's impossible to NOT be inspired by this book! Coming out November 13th, this is the perfect gift for literally anyone in your life, and we are looking forward to introducing you to a sweater capsule inspired by these illustrations later this month - stay tuned! Everyone seems to be talking about this new installation at the MET Breuer of Jack Whitten sculptures. Add this to your weekend list and bring the kids! Speaking of cool art sculptures, we went to Storm King with the kids a couple of weekends ago and it was the PERFECT way to spend a fall Saturday. Art sort of helps me remember that there is a whole other side to humanity than the one we are being fed on the news, and it's so so good. Now, please do yourselves a favor and buy the Ninth Street Women book. The sleeve states: "Set amid the most turbulent social and political period of modern times, NSW is the impassioned, wild, sometimes tragic, always exhilarating chronicle of five women who dared to enter the male-dominated world of twentieth-century abstract painting - not as muses but as artists. From their cold-water lofts, where they worked, drank, fought, and loved, these pioneers burst open the door to the art world for themselves and countless others to come." CHILLS. I just started it and am already learning so much! This duck is one of the most beautiful creatures I've ever seen. I hope he stays put. Here's some beautiful jewelry I just discovered on my Insta feed. I know Halloween is over, but the most fun parties of the year are always at Allison Sarofim's house in the West Village. This year's theme was "Pop goes the Pharaoh" and it was epic as usual. Check it out. Another friend, Nell Diamond just launched a new product line of chic as hell bath towels at Hill House Home. Scoop these up - they're not going out of style any time soon. P.S. Shout out to our Bleecker street neighbor! I was really touched by this instagram video from Jennifer Garner of all people. On the celebrity tip, did you catch George Clooney's response to the President calling him a "Hollywood Elitist." Oh snap! If you haven't yet taken the time to see and really appreciate this week's NYMag cover, please do. Michael Avedon captures twenty-seven school shooting survivors as they "bear their scars and bear witness" to one of the most devastating realities plaguing our country. It's powerful and moved me to tears. Finally, I wanted to just give a thanks and a shout out to all of my friends and strangers who are out there knocking on doors in states like Georgia and Tennessee. You're leaving your families and you're giving up of your weekends, and you are just beyond cool. Also, thank you Oprah for doing your thing!!! She just announced yesterday that she will be hitting the trails for Stacey Abrams!